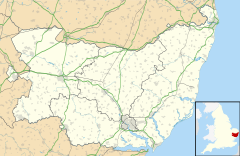 Walsham-le-Willows is a village in Suffolk, England, located around 2½ miles (4 km) south-east of Stanton, and lies in the Mid Suffolk council district. Queen Elizabeth I had granted Walsham-le-Willows to Nicholas Bacon, Lord Keeper of the Great Seal, in 1559. Because the village is documented unusually fully in surviving records of the time, the Cambridge historian John Hatcher chose to use it as the setting for his semi-fictionalised account of the effects of the mid-14th century plague epidemic in England, The Black Death: A Personal History (2008). Walsham-le-Willows has a Non-League football club Walsham-le-Willows F.C. currently in the Eastern Counties League who play at Sumner Road. Kenneth Melton Dodd (editor), The Field-Book of Walsham-le-Willows 1577 (Ipswich: Suffolk Records Society, 1974). ^ "Civil Parish population 2011". Neighbourhood Statristics. Office for National Statistics. Retrieved 29 August 2016. ^ Hatcher, John (2008). The Black Death: A Personal History. Cambridge, Massachusetts: Da Capo. p. 1. ISBN 0-306-81571-0. This Suffolk location article is a stub. You can help Wikipedia by expanding it. This page was last edited on 25 February 2019, at 23:15 (UTC).